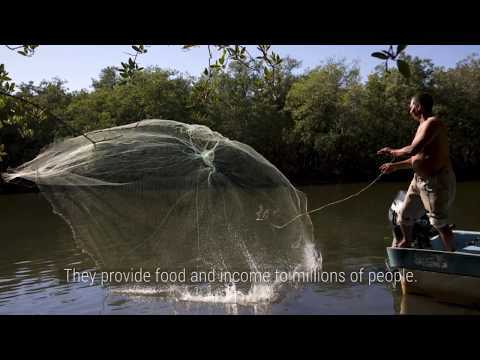 In El Salvador, local rural communities depend on the mangroves and the creatures that thrive in them for food and their livelihood. Mangroves also act as buffers against the threats posed by climate change by bolstering shorelines from rising seawaters and trapping carbon emissions. La Unidad Ecológica Salvadoreña (UNES)—an organization supported by AJWS—is protecting endangered mangrove forests in Ahuachapán Department. Through World Renew and the Senegerama Informal Association, Samwel Manyama - who lives in Tanzania - was able to get the legal title to his land. Now he has a tree farm and grows crops. He is starting a business and is dreaming of brighter futures for himself, his wife Prisca, and their children. Saem Sokhey is the newly elected Community Based Organization (CBO) leader of Srae Chrov village. In addition to her rice fields she also has a small piece of land about 2 kilometers from her home where she grows corn. During the harvest season, she picks corn every day. She will boil it at her home in the early morning and early afternoon, and then she takes a basket of steaming corn on her motorbike to sell in the village. Saem Sokhey is different from her neighbors. Her industrious and hard-working spirit shines through and gives confidence to the villagers that she can speak out on their behalf. Paul Kamau checks his maize crop. Each year, millions of people are driven from their homes by natural disasters such as floods, storms, and droughts. Most live in the world's poorest and most conflict-ridden states, and lack the resources to recover after a crisis. As climate continues to change across the globe, natural disasters will become more frequent and more severe. Oxfam America and the development organization RACHANA helped farmers using system of rice intensification practices (SRI) to develop a special weeder tool they can use to reduce the labor needed to weed between rows of SRI rice. Oxfam is working with rice grower cooperatives in the Artibonite River valley to help them improve their production and processing, and earn more for their crop. Mary Makkazi is a single mother with five children in Uganda. Everyday she works her maize farm so she can pay for her children to attend school. With a loan from Opportunity, Mary was able to buy better seeds and fertilizer. She also received tools and training that helped her improve her harvest. Mary now produces so much maize that she has been able to build a house for her family. She also hired someone to help her tend the land, thus creating a job in her community. Opportunity can change everything. A donation from you today can help transform another family's life, just like Mary's. Allaye Kalite, rice farmer from Korianze, Mali. "NEF noticed our [water] pumps weren't strong enough. They asked if we were willing to develop the area. That's how we started to build our dams. We didn't always have this quality cereal, NEF brought it to us. One year ago NEF gave us what we needed to help ourselves. Even if they had to leave, we'd still be able to control the water, manage the fertilizer, and produce all the rice we need. Last year, each rice paddy produced 32 sacks of rice per hectare. I am proud to say this year they will produce 80 sacks." Simha Helbrin, Israeli farmer and olive oil producer, speaks about NEF's Olive Oil Without Borders program. "I believe that tomorrow...next year...we will sell together. One bottle from Israel, and one bottle from the Palestinians."